Salomon Speedcross 3 - Tackle trails with swift precision in the Salomon Speedcross 3 shoe. 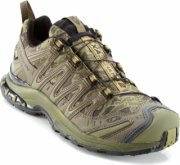 This men's outdoor shoe features a water-resistant synthetic and anti-debris mesh upper. The Quicklace™ system secures a customized fit, while Sensifit™ technology wraps the foot in comfort. The synthetic lining wicks away moisture and an Ortholite insole provides stability as well as antimicrobial protection. The aggressive Contagrip rubber outsole of the Salomon Speedcross 3 trail shoe lends exceptional grip and durability in mud, snow and challenging terrain. Salomon XA Pro 3D Ultra GTX - Salomon XA Pro 3D Ultra 2 GTX Trail-Running Shoes for Men Features. Salomon XA Pro 3D Ultra 2 GTX Trail-Running Shoes for Men. Enjoy working out with the Salomon XA Pro 3D Ultra 2 GTX Trail-Running Shoes for Men. The Salomon XA shoes come with a 3D Advanced Chassis between the midsole and outsole that maximizes energy control and performance. These running shoes have the unique quicklace system tightens these shoes with a single pull. Salomon Speedcross Trail Run - Salomon Speedcross 3 CS Trail-Running Shoes for Men Features. Salomon Speedcross 3 CS Trail-Running Shoes for Men. The Salomon Speedcross 3 CS Trail-Running Shoes for Men are a great pair of shoes to enjoy your run in comfort. These shoes are lightweight, thanks to the two layer of EVA in the midsole, to help you improve your running ability. These shoes have a water-resistant upper that prevents water from seeping in, while the breathable lining circulates air to keep your feet dry and cool. Montrail Mountain Masochist II - Lightweight and responsive, the Montrail Mountain Masochist II™ shoe offers support and stability on aggressive terrain. This men's trail-running shoe features a webbing and strap closure system for an exceptional fit; the gusseted tongue and full-length Trail Shield™ protect the foot from rocks and debris. FluidPost technology for customized pronation control and support on any terrain. Big, angled blades in the forefoot of the Gryptonite™ rubber outsole dig deep for exceptional grip in the Montrail Mountain Masochist II™ trail shoe. Salomon XR Mission - The Salomon XR Mission Shoes are trail running shoes that you can hit the road in. The Sensiflex lining material is super flexible, and supported with an external TPU framework. This allows the shoe to better adapt to the natural flex pattern of your foot. The XR Missions are lightly cushioned to protect your feet from rocks and debris, but you still get great feel for running on the road. These men's shoes are designed to roll smoothly from heel to toe, giving you great stability and efficiency. Inov8 F-Lite 195 - The Inov-8 F-Lite 195 is a minimalist trail running shoe. It is designed for those who have transitioned into a minimalist shoe and natural running style. The F-Lite 195 might not be identical but this is the twin brother of the X-Talon™ 190 and it is radically different from all other Trail Running Shoes. The F-Lite™ 195 will redefine expectations for elite runners looking for the highest levels of proprioception and the most natural foot position. Salomon XT Wings 3 - Salomon XT Wings 3 Trail-Running Shoes for Men Features. Salomon XT Wings 3 Trail-Running Shoes for Men. With the Salomon XT Wings 3 Trail-Running Shoes for Men you can obtain a greater running performance. The seamless uppers are made of quick drying breathable mesh and textile for a fresh feeling. Thanks to the sensifit construction that wraps the foot with synthetic overlays, you can get a precise, secure fit, and abrasion protection. The North Face Hedgehog GTX XCR III - FEATURES of The North Face Men's Hedgehog GTX XCR III Shoe. SPECIFICATIONS of The North Face Men's Hedgehog GTX XCR III Shoe. X-2 dual-density compression-molded EVA midsole for cushion and stabilityNorthotic Pro upgraded EVA footbed with Poron Resource heel and forefootcushioning pads and ESS Heal Cradle Pro supportSynthetic leather upper with breathable mesh keeps shoe lightweightWaterproof, breathable Extended Comfort Range Gore-Tex keeps feet dryVibram® rubber outsole grips to various surfaces, wet or dryLightweight, responsive Vibram rubber outsole for traction and gripImportedInjection-molded TPU shank and Snake Plate provide protection under the forefootHeal Cradle Pro centers the heel and enhances underfoot stability. Salomon XA Pro 3D Ultra CS WP - Salomon XA Pro 3D Ultra CS WP Trail-Running Shoes for Men Features. Salomon XA Pro 3D Ultra CS WP Trail-Running Shoes for Men. The Salomon XA Pro 3D Ultra CS WP Trail-Running Shoes for Men are ideal for running and trail-hiking enthusiasts. These shoes integrate the climashield waterproof system to protect your feet from the water. They offer optimal ankle support, thanks to the low-cut profile. The gusseted tongue prevents debris from entering the shoe, and with the quicklace system with pockets you can tighten and loosen the laces easily to fit your preference. Inov8 F-Lite 230 - The Inov8 F-Lite 230 Unisex Trail Running Shoe is an elite lightweight racing flat ideal for use on hard pack mountainous terrain and shorter distance races. It has a low profile midsole with sticky rubber outsole. Radical design provides good upper support while the patent pending fascia-band aids propulsion efficiency of the running cycle. The stable, low profile 2 arrow Shoc-Zone and lightweight upper makes the 230 the shoe of choice for Crossfit. Inov8 Roclite 315 - Please select a half size up as this shoe runs a half size small. (If you wear a Men's size 9, please choose a Men's size 9.5. If you wear a Women's 8, please select a Women's size 8.5.) Running shoe built for the neutral to under-pronator who requires an enhanced cushioning and extended durability. The RocLite™ 315 is an ultra distance and off road running shoe providing high levels of comfort, upper support and grip. Mizuno Rider 16 - Mizuno Wave Rider 16 - Women's The Mizuno Wave Rider 16 running shoe is built for the neutral to underpronator who requires enhanced cushioning. Showcasing a uniquely shaped midsole, Mizuno Wave Technology® absorbs impact forces and spreads the energy through the entire foot, creating a smoother, softer ride. SmoothRide Engineering™ offers a rocking-chair-like transition from heel to toe, which promotes a efficient running motion and propels your forward. For responsive energy return, the lightweight AP+ midsole promises a "bouncier" feel. Vasque Mindbender - The Men's Mindbender Shoe by Vasque. Running an ultra is a mind-bending experience. The Mindbender was developed to help you wrap your head around the challenge. Built on the Perpetuum last, this light but rock solid shoe was created to eat up miles without eating up your feet. FEATURES of the Vasque Men's Mindbender Shoe. SPECIFICATIONS of the Vasque Men's Mindbender Shoe. Built on a straight last which is ideal for those who need less arch support. Asics GEL-Kayano 19 - Take a "stop at never" approach in the ASICS GEL-Kayano 19 running shoe, which offers top-of-the-line technology and an exceptional fit. This men's athletic shoe features a breathable, stretch mesh Biomorphic Fit upper to ensure a chafe-free fit and an asymmetrical lacing design for lasting comfort; reflective details increase your exposure in low-light conditions. The Personalized Heel Fit (PHF) creates a customized heel fit; the ComforDry™ sockliner offers antimicrobial protection. Rearfoot and forefoot GEL cushioning absorbs shock and enhances comfort. Inov8 Oroc 340 - On your mark. Get set. GO! The OROC™ 340 by inov-8™ offers the versatility and comfort to take you from those long training sessions right up to race day. Ideal for on and off-road use and mixed terrains. Performance upper constructed of quick drying mesh for optimum breathability. Padded tongue with plush heel cup to accommodate a variety of heel shapes. Met-Cradle™ webbing provides forefoot security, while allowing for natural fluid movement. Brooks T7 Racer - Brooks T7 Racer - Men's This product can be shipped to US addresses ONLY. The incredibly light Brooks T7 Racer road racing shoe is the fastest in the pack. The streamed lined, asymmetric upper works with the anatomy of the foot to perfectly wrap the arch securely from start to finish. Air mesh upper with synthetic overlay materials. Rearfoot HydroFlow® ST enhances midsole cushioning. Engineered Hyper-Pod™ technology sets the foot in an efficient, balanced position from heel strike to toe-off, offering maximum stability and flexibility. Nike Zoom Streak LT - Nike Zoom Streak LT - Men's The Nike Zoom Streak LT track flat is designed for use on the track, roads or XC surfaces. Ultra-lightweight upper features highly breathable/drainable mesh and an internal arch bandage that provides lightweight, targeted support through the midfoot. Full-length Cushlon midsole with a Nike Zoom™ unit in the heel offers added protection. Embedded midfoot shank delivers an improved heel-to-toe transition. Mini Waffle® outsole gives durable traction and grip. Adidas AX 1 - A tough as nails outdoors shoe built for all day adventure, the AX 1 Trail Shoes for Men from Adidas provides comfortable support for all kinds of outdoor fun. Built to go light and fast, the AX 1 features a featherlight and breathable open mesh upper with internal synthetic support and a soft, cushioned collar. Inside, the shoe's molded sockliner enhances comfort and fit, while the EVA midsole provides long lasting cushioning and shock absorption.